It’s malicious. It’s unrelenting. Big Lies repeat one after another. Official sources announce them. Mainstream media regurgitate them as gospel. It’s standard practice. 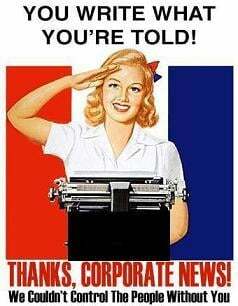 Agitprop substitutes for accurate reporting. Ukraine crisis misinformation proliferates. Responsible Russian replies get short shrift. Often they’re ignored. Sometimes they’re twisted irresponsibly. One observing UN Charter principles. One entirely legal. One contradicting Western lies claiming otherwise. “Serious work must be done to modernize the military structure in Crimea,” he added. Most Ukrainian forces reject Kiev putschists. They remain in Crimea. They do so freely. Reports otherwise are false. Those wishing to remain on active duty are being integrated into Russia’s military. Their services are valued. “They will retain their military ranks and service record and have their school diplomas recognized,” said Putin. All Ukrainian military personnel in Crimea wishing to return home either left or plan to. Around 2,000 of Kiev’s 18,000 contingent chose to do so. Moscow provided them help to return home. Spurious Western reports lied about Russian troops massing on Ukraine’s border. Invasion perhaps is imminent, they suggested. Saying so is malicious propaganda. Throughout Ukrainian/Crimean crisis conditions, Putin acted responsibly. International laws were observed. They still are. He’s geopolitically opposite Obama. Reprehensible Western reports claim otherwise. Lies substitute for truth. On March 28, Russian Foreign Ministry spokesman Alexander Lukashevich responded responsibly. He debunked false charges. The Russians aren’t coming. Aggression isn’t planned. No evidence suggests an imminent attack. Inspectors from Belgium, Estonia, Finland, France, Germany, Lativa, Switzerland and Ukraine were in direct contact with Russian military unit chiefs on the ground. They photographed deployed sites and military equipment freely. They accompanied Russian forces on maneuvers. They know no threat exists. They informed their superiors. Falsified reports claim otherwise. They stoke fear. They bash Russia maliciously. They do it daily. It bears repeating. Big Lies drown out truth. Mainstream media echo them like gospel. Lukashevich issued a detailed statement. It’s repeated below in its entirety, saying. “An opportunity to hold these inspections was offered to everyone who wished to get familiarized with the actual state of affairs in the areas (of Russia – Itar-Tass) adjoining the Ukrainian border. The results of the inspectors’ work were reflected in the official reports distributed to all the member-states of the OSCE. On Friday, Putin called Obama. He did so to discuss Ukraine. Itar Tass said he stressed ongoing violence by extremists. They’re “committing acts of intimidation against civilians,” he said. They act with impunity. Putin urged international efforts to stabilize things. John Kerry and Sergei Lavrov will meet to discuss joint US/Russian efforts to do so. Putin acted responsibly. An irresponsible White House press release lied saying otherwise. “President Obama reiterated that the United States has strongly opposed the actions that Russia has already taken to violate Ukraine’s sovereignty and territorial integrity,” it said. He urged Putin to support what demands rejection. He lied claiming Russian troops massed on Ukraine’s border. Avoid “further provocations,” he said. He twists facts repeatedly to fit policy. He threatens world peace. He threatens humanity’s survival. Putin isn’t naive. He knows what he’s up against. He knows Washington’s imperial ambitions. He’s been outspoken about them many times. Washington bears full responsibility. Rogue Western nations and supportive media share it. “(T)he world (is) again being led down the garden path by lies and propaganda…(T)his time (it’s) (on) behalf of (unchallenged) American world hegemony,” Roberts stresses. Putin understands the threat. He’s going all-out to defuse it. He has no willing partner in Washington. Advancing America’s imperium matters most. Obama reflects the worst of rogue leadership. He’s duplicitous. He’s a serial liar. He represents corrupted monied interests. He’s a war criminal multiple times over. He’s waging war on humanity. He’s doing it at home and abroad. He blames victims for his crimes. Millions of corpses attest to his barbarity. His belligerence risks World War III. On Friday, Security Council members met in closed-door session. They did so to discuss Ukraine. UN envoy Vitaly Churkin explained Moscow’s position publicly. “Someone must seriously think through what they are doing and the consequences of certain actions they are advocating,” he said. Ukraine needs legitimate governance. It needs constitutional reform. It needs them in place before elections are held, Russia stresses. “There is no political leader in sight who might be able to unite the country,” said Churkin. “The other thing that is going to come up in the next couple of months is most likely dramatic decline of the living standards of people, because of IMF package which now has been proposed to them” and accepted. Western nations urge Russia to engage in dialogue. At the same time, they turn a deaf ear to what it’s saying. Ukrainian conditions remain chaotic. Stability is nowhere in sight. Fascist putschists run things. Responsible governance is absent. Sham May elections aim to legitimize illegitimate rule. Democracy is strictly verboten. Russia in under no illusion. Western supported rogue Ukrainian governance threatens its security. Potential civil war looms. Igniting it risks cross-border spillover. Doing so risks global war. Russia is going all-out to defuse things. Its best efforts may not be enough. She’s against economic sanctions. She hopes to avoid them. Germany is heavily dependent on Russian natural gas. After China, it’s Berlin’s largest trading partner. Volume approaches $100 billion annually. Thousands of German companies are involved. Hundreds of thousands of jobs are at stake. Safeguarding them is vital to Germany’s economy. Merkel is responsible for doing so. Russian parliamentarians are considering imposing sanctions on US companies. Reports suggest setting limits to offices considered legal entities. US companies want business as usual to continue. Bottom line priorities matter most. Political disagreements hurt them. How much they’re able to curb further action remains to be seen. It bears repeating what previous articles stressed. Today is the most perilous time in world history. Paul Craig Roberts is justifiably worried. People don’t “learn from history,” he says. Obama bears full responsibility.